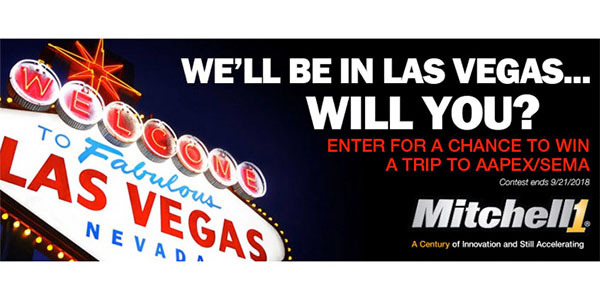 Mitchell 1 has announced the return of its “Fabulous Las Vegas” sweepstakes, running now through Sept. 21. One lucky winner will receive an all-expenses-paid trip for two to attend this year’s Automotive Aftermarket Industry Week (AAIW) events, including AAPEX and the SEMA Show in Las Vegas. To enter, visit the Mitchell 1 Facebook page and submit the online form. One grand-prize winner will receive round-trip airfare for two people to Las Vegas, four days and three nights in double occupancy hotel accommodations, two attendee badges for AAPEX and the SEMA Show and one $500 Visa prepaid card. While in Las Vegas, the sweepstakes winner will have the opportunity to see firsthand how Mitchell 1 is a source for every step of the repair process with its complete line of integrated software and services. Mitchell 1’s family of products for the automotive and trucking industries includes ProDemand, Manager SE, SocialCRM and TruckSeries. Mitchell 1 will be wrapping up the year-long celebration of its 100th anniversary and demonstrating its full line of products in booth No. 438 during the AAPEX show at the Sands Expo & Convention Center. For more information about Mitchell 1, visit mitchell1.com, call 888-724-6742, or locate an independent sales consultant at mitchellrep.com.